Discussion in 'Defence & Strategic Issues' started by Triton, Feb 25, 2009. All 135 people aboard Turkish Airlines flight 1951 had a miracle escape when their Boeing 737 jet crashed into farmland just short of Schiphol airport in Amsterdam this morning. Despite the fact that the aircraft broke into three in the force of the impact, fire did not break out and none of the 127 passengers and eight crew on board was killed, according to both the Turkish transport minister and the chief executive of the airline. “The good news is that there was no loss of life in the accident” said Binali Yildirim, the transport minister. He added that about 80 people had been evacuated from the plane. Airport officials said that the plane from Istanbul's Ataturk airport came down on farmland amid low cloud and poor visibility while on its approach to Polderbaan, the newest runway at Schiphol, at 10.30am local time. Miracles does happen; happy to know that there was no loss of life. I just heard on tv one person died, 50 escaped unhurt, rest not known??? Just saw, it now! God Speed. Feb. 25 (Bloomberg) -- A Turkish Airlines plane carrying 127 passengers and seven crew members crashed near Amsterdam’s Schiphol airport, the airline said. At least three people may have died, CNN Turk and Dutch broadcaster NOS reported. The Boeing 737-800 airliner broke into three pieces, video aired by international broadcasters showed. About 20 people were injured, the airline said. The plane crashed in a meadow near Schiphol between a motorway and a runway, NOS said. An unidentified eyewitness told RTL Television that passengers were being treated near the crash site and that about 20 ambulances were at the scene. A Schiphol airport spokeswoman, Kathelijne Vermeulen, couldn’t provide more details on today’s crash. The Turkish Airlines Boeing Co. 737-800 aircraft that crash- landed in Amsterdam today was built in 2002, according to the Ascend Online Fleets database. The short-haul plane had the registration number TC-JGE, Ascend said. Boeing’s 737-800 model entered service in 1998 as the Chicago-based manufacturer introduced the so-called Next Generation of its best-selling plane. The type is powered by two CF56 engines from CFM International, a partnership of General Electric Co. and Safran SA of France. (RTTNews) - Nine persons were killed when a Turkish Airlines plane crashed on landing at Amsterdam's Schiphol international airport Wednesday. The Boeing 737-800, carrying 127 passengers and seven crew members and on a flight from Istanbul to Amsterdam, broke into three pieces when it touched the ground just short of the runway. Initial reports quoting Candan Karlitekin, head of the airline's board, said all the passengers and the crew members survived the crash. The plane came to rest on its belly alongside the A9 motorway near Schiphol Airport, 20 kilometers southwest of the Dutch capital, Amsterdam, while trying to land under light fog conditions at 10:40 a.m. local time. The fuselage of the plane was split near the front of the wing with the tail section sheared off. Acting Mayor of Haarlemmermeer, Michel Bezuijen, told reporters that 50 passengers were injured, half of them critically. The cause of the accident was still not clear, he added. Wim Kok, a spokesman for the Dutch Anti-Terror Coordinator's office, ruled out any act of terrorism behind the incident. Dozens of ambulance vans and rescue crews were pressed into service immediately after the tragedy occurred. All flights to and from Schiphol, one of the main aviation hubs in Europe, have been suspended, and the A9 motorway around the airport has been closed for traffic. Engine trouble may have caused the Turkish Airlines crash that killed nine people in the Netherlands, the accident's chief investigator said yesterday. Pieter van Vollenhoven told Dutch television that the Boeing 737-800 had fallen almost directly from the sky, which pointed toward the plane's engines having stopped. It has not yet been established why they cut out. Five Turks and four Americans died when passenger flight TK1951 from Istanbul crashed landed about one mile (1.5 kilometers) short of the runway at Amsterdam's Schiphol Airport on Wednesday morning. 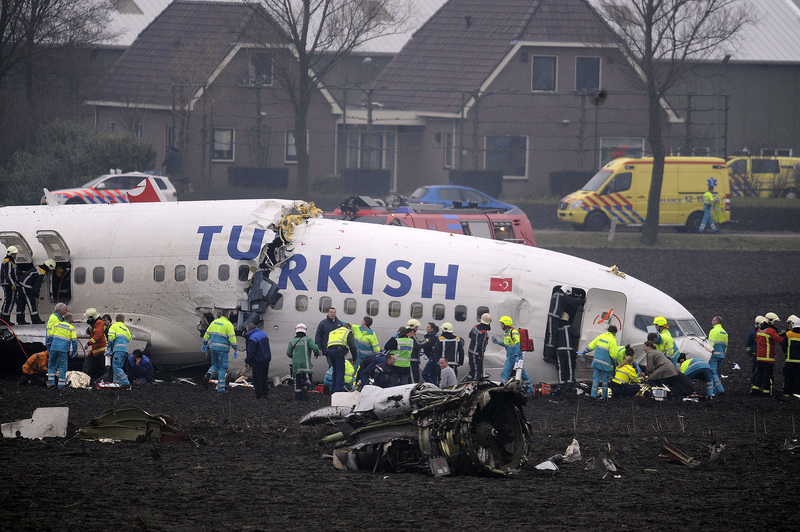 THE HAGUE, March 4 (RIA Novosti) - Preliminary investigations have shown that a faulty altimeter combined with pilot error were responsible for the crash of a Turkish airliner in Amsterdam last week, the Dutch investigators said on Wednesday. According to Dutch Safety Board chairman Pieter van Vollenhoven, the Turkish plane with 128 passengers and seven crewmembers on board, which crashed at Amsterdam's Schiphol airport on February 25, had a faulty altimeter that had been noticed 24 hours before the flight left from Istanbul. Nine people were killed, including both pilots and one other crewmember, and another 86 injured when the plane crashed into a ploughed field just short of the runway. There are still 28 people in hospital with injuries, one of whom is in a serious condition. Van Vollenhoven said the airliner was equipped with two altimeters, of which the left was displaying an incorrect altitude figure. However, the right altimeter showed the correct altitude. The landing was being conducted on auto-pilot, so the engines of the aircraft reduced their speed too early because of the incorrect information coming from the two altimeters. He also cited a number of pilot errors. Although the aircraft was landing on auto-pilot, it took the commander some 100 seconds to realize that he was coming in too low and too far from the runway. The second pilot, who was controlling the aircraft at the time, was making his first landing in a Boeing 737-800. The commander took control of the plane too late, and crash-landed the aircraft in a field at 175 kilometers an hour (100 mph). Van Vollenhoven also said that the initial angle of the plane's descent was incorrect, making a sharp drop from 2,000 feet, and that its decrease in speed was too abrupt. Investigators into the crash have said that there are no signs of a fuel shortage on board the aircraft, which was initially suspected as a cause. Other factors such as hitting birds, ice, turbulence, and engine or systems failures, have also been ruled out.